As sophisticated as it looks, Panna cotta is unbelievably easy to make. Fabulous for dinner parties and can be made a day or two in advance and kept in the refrigerator. I also love it because it’s a real versatile recipe that can be combined easily to whatever seasonal fruits available. Perfectly served with caramel sauce, honey, tropical fruits, cappuccino, coconut, etc… but my favorite combo is Lemon Panna Cotta with Strawberries! The lemon’s affair with the strawberry is scandalous. This recipe is irresistible and I haven’t found one person who doesn’t absolutely love it! I served it yesterday to my guests, and they practically licked the flute clean:) I love this feeling. Satisfying! This recipe is pretty much my own after I’ve tried so many others from books and websites, it’s easy and delicious. That’s the beauty of Tuscan cooking: simple and effortless. Enjoy! 50g fresh strawberries, hulls removed and cut in half to decorate. 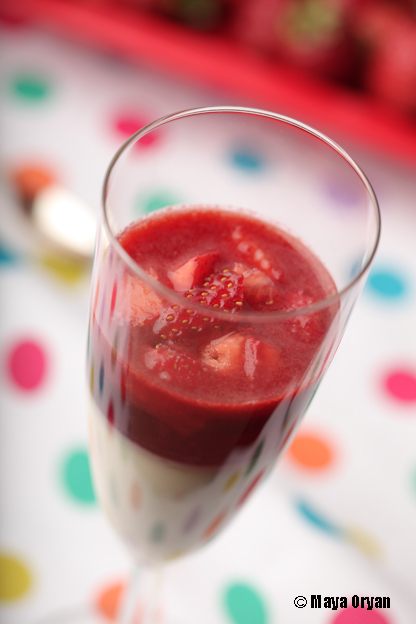 To make the strawberry coulis: In a medium saucepan, combine the strawberries, butter, sugar, and lemon juice. Cook over medium-high heat until the sauce becomes like a purée. Remove from the heat. If you like your coulis thin, strain it or blend it swiftly with a stick hand blender. To make the Panna Cotta: Sprinkle the powdered gelatin over the cold water and let soak for 5-10 minutes until soft. Remove from heat and stir in the soaked gelatine, limoncello, lemon peel and sour cream until smooth. 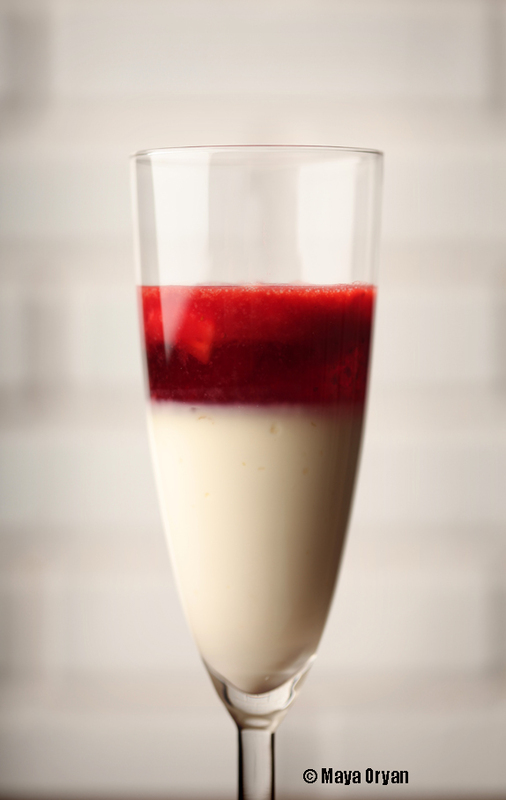 When the Panna Cotta has firmed, pour a layer of strawberry sauce over each treat and decorate with fresh strawberries. Let set up in refrigerator. This entry was posted in Desserts, Recipes and tagged dessert, Food Stylist, lebanese food blogger, lemon panna cotta, Maya Oryan, Panna cotta, strawberry panna cotta by Maya Oryan. Bookmark the permalink. This looks lovely and so classy. I love panna cotta. Thank you for visiting my blog. I will sure try some of your recipes! This looks wonderful! I’ve never made panna cotta but it’s on my list.